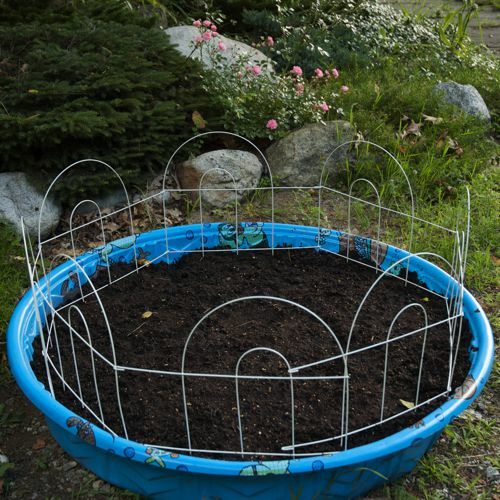 Plastic kiddie pool garden planters are inexpensive and easy to make. You can plant anything that has shallow roots, which includes most herbs and many vegetables. This would be a great way to have a combination of herbs, lettuce, and some smaller vegetables in one place. Just be careful where you put a pool planter; if you put it on your lawn, it will probably kill the grass underneath. The first step is to cut drainage holes in the bottom of your kiddie pool with the utility knife. This should not be difficult if you have a sharp blade or if you have a drill. Cut a lot of large holes (approximately 1-inch) in the bottom of your pool. In addition to drainage on the bottom of your kiddie pool, drill or cut holes into the sides. Ideally, the holes should be about 1/4 to 1/2 inch above the bottom of the pool, just in case the bottom holes are not letting out enough water. If you have plants sitting in soggy soil, it will kill most of them, so having good drainage is key. You can also elevate your pool by putting it on bricks or wood to make sure the water can get out of the bottom. Once you have finished putting in your drainage holes, you will need a barrier to keep the soil in and let water out. You can use plastic window screening or a newspaper. Cut out your barrier so that it is big enough to cover all of your holes. Then lay the screening or newspaper on the bottom and up the sides of your pool. Situate your pool in a sunny spot. If you are growing herbs or vegetables, you will need full sun at least six hours a day. Fill your pool either with potting soil or a combination of potting soil and garden soil. Mix in a slow-release fertilizer. Smooth out the soil in your garden planter and pat it down gently. You want your soil to be loose, but you also want an even surface. You can plant any flower or vegetable that doesn’t have deep roots. If you are using any fencing, put it in before planting, so you won't disturb the seeds. One of the biggest mistakes people make when planting seeds are to plant them too deep. Check the information on your seed packet to see how deep and far apart you should plant them. Make rows in the soil according to the directions on your seed packets. Once you have planted your seeds, you will want to give your garden a deep watering, preferably until water runs out the bottom of your garden planter. It is important, particularly at this point, not to use a harsh stream of water that will disturb your seeds or wash them away. Either use a watering can with a rose attachment or a garden hose with an attachment that will provide a gentle spray. The fastest way to kill growing seeds is to let them dry out. In the early stages of germination, keep your soil moist at all times. You will probably have to thin your seedlings after they get their first set of full leaves. Follow the space recommendations on your seed packets. If you are growing basil, once it is about 4 to 6 inches tall, let the soil dry out a bit between waterings. Also, if you are growing herbs, do not feed them too heavily, go easy on the fertilizer. You will get the most flavorful herbs if the soil is somewhat poor in nutrients. The same is true for nasturtiums, which will also flower more if fed less.